The first thing that catches the eye when visiting Genesis Casino is its futuristic design and interface. The theme they have employed is very unique, with a nod towards outer space, astronauts, and far away galaxies. The whole thing looks very pleasing to the eye while not distracting from the actual content, namely, casino games. And there are tons of these games out there on Genesis Casino, which boasts of a catalogue that contains more than 1300 unique titles! 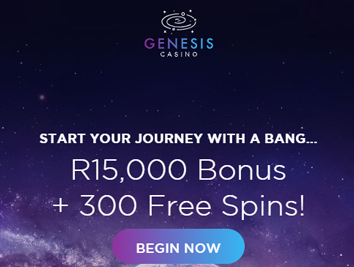 Besides the eye candy and a truck-load of games, Genesis Casino also has something specially designed for South African gamers: the casino accepts payments and withdrawals in Rands, which is something pleasantly surprising for an international casino. And thanks to the sophisticated software platform underneath it all, Genesis casino is also universally compatible with most PCs and mobile devices. Many casinos these days still use outdated technology that involves tiresome downloads of client software and separate apps. We already have too many apps on our mobile phones! The good thing about Genesis casino is that it uses modern HTML5 web technology. It basically functions as an online casino in the form of a website. The only program you need to open Genesis casino is your favourite internet browser. It doesn't matter if you have an Apple device or Android, or Windows. They are all capable of smoothly running Genesis Casino. And once you register your account at the website, you can easily log in from multiple devices using your account name and password. Many casinos try to entice their customers using No-deposit and Welcome bonuses. At Genesis, instead of a no-deposit bonus, they offer you the chance to freely try out many games in their catalogue before signing up. And once you decide to join their casino with your registered account, the real fun begins. The Welcome Offer they have at Genesis casino is nothing to scoff at. In total, you could end up with R15,000 along with hundreds of free spins on selected slots games! To gain access to these free funds, you have to first deposit a minimum of R150 into your account. All bonuses at Genesis Casino come with a minimum wagering requirement of 40x the bonus amount. Once you satisfy these criteria, you can easily withdraw your winnings and bonus amount in ZAR from Genesis Casino! After your Welcome Bonus, the casino has got other cool bonuses to help you win more. The weekly bonus involves getting a matching bonus of 25% on Friday. Depending on how much you deposit in your account between Monday-Thursday, this bonus can go as high as R1500. The minimum deposit required to become eligible for this weekly bonus is R750. The procession of bonuses and promotions at Genesis Casino is quite long an enticing. There is the Lightspeed bonus, which helps you start your week with a bang with free spins on your favourite games. All you need to do is deposit and wager a paltry sum of R150 on the weekend (between Thursday and Sunday). You will get free spins on different games in your inbox. And you will never get bored because the fine folk at Genesis casino keep adding new games with this bonus. Since the list of games at Genesis Casino is pretty long, the list of software providers is also predictably on the longer side. The casino has nearly half a dozen software partners, and all of them are heavy hitters in the market. The live casino section is primarily handled by seasoned operators NetEnt and Evolution Gaming. The hundreds of slots, jackpot, and arcade games come from the stables of companies like NYX, Microgaming, Play’N’Go, and QuickSpin. These are all award-winning companies known for making top quality games with stable and secure software. No casino can survive without a good selection of slots and casino games. Genesis Casino does not disappoint in this regard. Slots fans will find plenty to enjoy here, with nearly 800 games on offer, including recent arrivals like Lucha Legends, Golden Grimoire, Bonanza Megaways, and Vikings Video Slots. Progressive jackpot games like Mega Moolah, Gunslinger, and Bonanza offer you a chance to earn millions with just a few clicks of your mouse/touchscreen! And if you are a fan of live casino games, the lobbies at Genesis are filled with popular variations of roulette, baccarat, blackjack, and poker. There are different betting tables with betting ranges to suit just about every player out there. The company behind Genesis Casino has definitely done its homework as far as the South African players are concerned. The casino has done everything possible to make the overall experience smooth and hassle-free for its customers in South Africa. With a dedicated landing page, country-specific customer care number, and above all the ability to make transactions in Rands, Genesis casino has managed to set an example of how a casino should cater to a particular market. Thanks to partnerships with highly reputed electronic payment brands like Neteller, Skrill, EasyEFT, VISA, and MasterCard, the casino even offers quick deposits and fast withdrawals, all in Rands. All this shows the pedigree of the company behind the Casino. After all, Genesis Global Ltd has made it a habit of creating customer-friendly casinos, like Mansion Casino. Genesis is the Malta-based company’s latest offering, having launched in 2018. Despite its young age, Genesis Casino is well worth a visit for South African players thanks to the plethora of services and features it offers.